Continuing along the same vein as my previous post, I thought I'd share some of my very favorite picture books to read with my children during the Christmas season. I have had a passion for children's books since long before I had children of my own, and have collected quite a stack of Christmas books. The ones I will mention here are not new for 2012, but they are such beautiful stories, I hope you'll take a look. 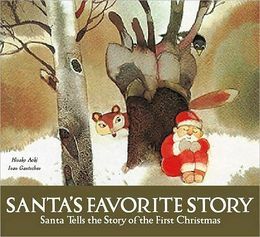 A fairly recent discovery of mine, which I learned about from someone at the Well-Trained Mind forums, is Santa's Favorite Story: Santa Tells the Story of the First Christmas by Hisako Aoki. I confess that we don't "do" Santa. My girls asked me years ago if Santa was real, and I had to tell them no. I love the idea of Santa, and we watch all the Santa Christmas specials (and own most of them on DVD), but we prefer to focus on the birth of Christ at Christmas. However, this book touched my heart and I love to read it aloud. In the story, Santa goes for a walk in the woods, ends up farther away than he realizes, and sits down to take a nap. The forest animals come across him sleeping, and become quite concerned, because it's Christmas Eve, and they are sure there can be no Christmas without Santa. When Santa wakes up, he soothes their fear and tells them of the first Christmas when Jesus was born. The illustrations are lovely watercolors, which add to the charm of the book. 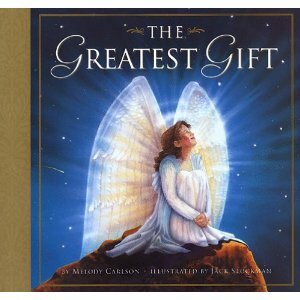 Another favorite is called The Greatest Gift by Melody Carlson. This book is about a little angel named Grace. As the time for Jesus to be born on earth approaches, God asks for an angel to volunteer to be the star that shines in the heavens to light the Son's way. The angels are reluctant to volunteer, because they have to give up the glory of heaven, and whoever becomes the start won't be an angel anymore. Grace cannot bear the thought of the Son going to earth alone, so she comes forward. After the star is done shining, it falls to earth, and becomes a stone. Grace is still aware of everything, even as a falling star and then as a rock. She ends up being the stone that covers the door of Christ's tomb. This story has a fantastic ending, and I don't want to spoil it for you. It's out of print, but perhaps you can find it at the library, or even purchase it used. It's worth owning. 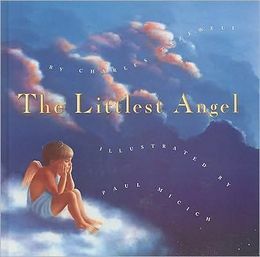 The last one I will mention here is called The Littlest Angel, by Chris Tazewell. This story is about a little boy who died on earth and is now an angel in heaven. He has a hard time being an angel and doing all the things angels are supposed to do; he wasn't really ready to be done being a little boy. He is allowed to return to earth and retrieve a box of his special mementos from earth, and that helps him settle in to heaven a bit better. As Christ is preparing to leave heaven to be born on earth, all the angels want to present Him with a gift. The one He chooses as His favorite is what makes this story so precious. I cry every time I read this book. I hope you have the opportunity to read it with your family. These three are at the top of my list. I have many more Christmas books that I love, and I may pull them out and share them with you sometime, but if you're looking for some new stories to read with your family this year, these are wonderful! Looks like a great list! We'll have to check those out! Oh my, I love The Littlest Angel. I always get choked up reading the last page.